The band formerly known as Riff Cannon now goes by Summoner, a four member group from Boston, Massachusetts, a town known to spawn a rock band or two over the years. Summoner consists of the same 4 members of Riff Cannon: AJ Peters on Guitar, Joe Richner on Guitar, Scott Smith on Drums, and Chris Johnson pulling doulble duty on Bass and Vocals. Summoner have just released the second full length album by this group of 4 gifted rockers, a collection of stoner rock gems by the name of “Phoenix”. 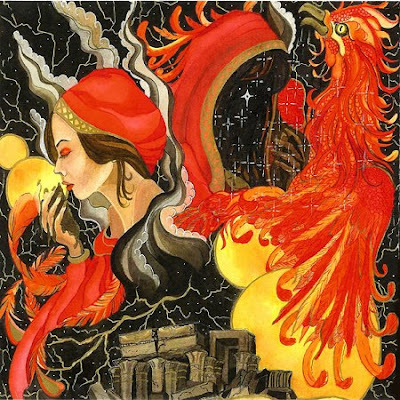 “Phoenix” is an album that fits quite nicely into the classifications used for the progenitors of desert rock or stoner metal such as Kyuss or Sleep because Summoner certainly hit their notes, crank their riffs, and grab you hard with fuzzed out hooks that not only are identified by those genres, but expand the genre’s definition. This is due to the high quality music arranged and offered for the fortunate few who follow this wonderful style of metal. Summoner not only is a departure in name from their first iteration as Riff Cannon, but a departure as well in the musical offerings on the associated albums. Instead of trying to outdo themselves on an album that would be quite difficult to top, Summoner decided to go in a slightly different direction. Riff Cannon, true to its name, could be characterized by the hard hitting fuzz assault of the majority of songs on the “Mercury Mountain” collection, while the new name, Summoner, perhaps conjures up a more mystical tone. “Phoenix” certainly follows through on that promise with songs that tell a tale straight from the murky mists of the minds and imaginations of Robert E. Howard or Edgar Rice Burroughs, songs that could well accompany many of the muscular fantasies represented in the paintings of Frank Frazetta or Boris Valejo. “Phoenix has as much to offer as an album can offer in terms of content and quality. Each song is highly crafted and deftly executed, full and rich in structure, intelligent in design, and crafted to reveal wonderful nuances or hidden pearls with each journey through the magical realms conjured forth on the music and in the lyrics. Summoner have gone beyond merely making a good stoner album by crafting a fine piece of high musical quality that is all the more delightful in the execution of those distorted guitars, pounding, thumping bass chords, and the ever present and primal rhythm of the drums, keeping the pace steady and constant throughout each jewel of a song. The album starts with perhaps its hardest hitting piece, “The Interloper”, a song that rivals the best of past or present stoner rock offerings, a song that Sasquatch would be proud to play, or Dozer would have to stop and wonder if it had been one of their own, while still retaining its unique sound and quality that can only be attributed to Summoner themselves. The album moves into “Winged Hessians”, a title alone that deserves reflection and perhaps a tip of the hat. The song drives hard, deliberate in execution, and wonderful in fullness of instrumentation. Just as with all the songs on this album, the guitars perform wonderful interludes and riffs, moving from solo like wailings into heavier, deeper fuzziness, while setting the tone for a mystical journey to follow. Next up is “Conjuring”, a faster paced offering, deep and deadly with its guitars, driving hard and low, changing up just enough to captivate and lull you into euphoria and bliss. There is lots to discover on this song with each and every listen, lots to enjoy each time you let its fantasy tale course through the music receptors of your brain. “Let the Light In” begins slow and deliberate, a simple guitar playing a lonely tune before being joined by its gifted brother guitar, stark and light in their offering, haunting in their melody before moving in and out of short intervals of stoner psychedelica where urgency is the order for a brief time before returning to the haunted vocals of the teller of the tale. This song has a great haunting quality in the playing of the guitars, and the measured pacing of the drums and bass, punctuated by the near melancholy nature of the vocals, while moving in and out of periods of hard driving distortion throughout the song, taking you on quite a long and satisfying journey. The title track, “Phoenix”, is another in the pantheon of haunting and wonderfully executed melodies full of quality interludes of fuzz and psychedelica. The vocals are full and insistent here, adding to the telling of the tale in a slightly new way by taking a more active role at the forefront of the song while never sacrificing those wonderful guitars. This is another long and wonderful journey through space and time, taking you where only songs of this quality can go. “Across Iron Fields” returns to the harder driving guitars of the earlier songs, cranking out the voltage and distortion of fuzzed out hooks and riffs that display the telltale sound of stoner rock, while keeping to the haunting tale unfolding throughout. The penultimate song, “Reclaimer”, gives testament to Summoner’s ability as artists of high quality by offering at the outset something a little fresher, slightly different from the previous songs, while still adhering to the overall cryptic atmosphere of the tale being told throughout the journey. It begins light and mystical, moving into brief interludes of power fuzz, before reclaiming the haunting method originally displayed at the outset of the song. The coda, the end of the tale, is the wonderful, haunting, and powerful “Dead Moon” where Summoner execute riffs and hooks summoned from the mists and depths of the ashes left over from the hotly burning songs that led us on this mystical, fantastic journey of sound and wonderment. This is a haunting and powerful collection of terrific stoner/fuzz tunes of the absolute highest quality, something crafted carefully over time with thought and skill, and executed with passion and sincerity, adhering to the unspoken rules of the stoner rock genre while creating a unique and special compilation.